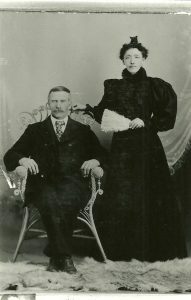 Peter Wold and Sara Eidal Wold, circa 1895. For the last twenty years of his life, Bertha’s father could write in English, at least at a basic level. In August, 1904, he wrote her a brief note, saying he was still not well enough to do the things he wanted to do when she came to visit. He suggested that she wait and come after Christmas when Mary [Wold] returned to Ellensburg (which would give him another four months’ recovery time). He sent love to her and her baby. On October 4, 1916, Peter wrote one of the latest letters in the collection. Again, it was just a short note. Bertha had sent flowers for her brother’s grave, and Peter had taken them to the cemetery. This is the only confirmation that we have that William’s grave is in or near Ellensburg. By this time, Peter was 81 and feeling his age. Peter would live to be 90, dying in 1925, twenty-two years after his son’s death. With William dead and Mary having left the Ellensburg area, Bertha’s stepmother, Sarah N. Eidal Wold, had to carry on her own correspondence. Three brief letters from the 1910s survive. In the first, sent September 18, 1910, she and her husband were sending apples to Bertha and to someone who had driven Peter in his automobile during a visit to the Issaquah area. Peter had received the straight razor Bertha sent to him, but he refused to use it until he could pay her back for it. On November 30, 1916, she sent a brief note to accompany a book she was sending to Bertha’s young son. She referred to Bertha having visited them, on her own, recently. The final letter in the collection is a brief thank-you note from Sarah, written in January of 1917.